There’s nothing more frustrating than cueing up a set of Google Maps directions to your destination only to lose service and have them evaporate while you’re in transit. Now Google Maps, websites, and even YouTube will work with no internet connection on your Android phone. Google announced the series of lighter apps for the audience it calls “the next billion”—people in developing regions where phones are also personal computers. The features will be rolling out later this year. The offline support was demoed onstage at today’s I/O conference. After pulling up directions in Maps, the phone is put into airplane mode—usually the kiss of death for any mapping app. But look! You can still poke around the map’s graphics as well as view the destination’s address, phone number, opening hours, and so on—they’re all still there and can be expanded as needed. Turn-by-turn directions are also supported offline. Voice directions work, too! 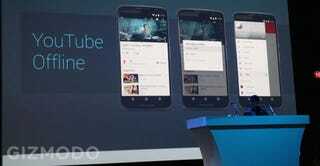 A similar streamlined approach to offline support is used for YouTube and websites on Chrome. YouTube’s feature is a simple archiving tool which allows a user to save a video for offline viewing for up to two days. Even more intriguing is something called a Network Quality Estimator for Chrome which analyzes the network connection to optimize both the search results and any webpages you click on, loading pages faster and prioritizing text and information over data-intensive images. The offline support will obviously benefit the millions of users in emerging markets where service is spotty or nonexistent without a wifi connection. But these are also incredibly useful tools for navigating cities, where subways, buildings, hills, and tunnels interrupt our ability to keep tabs on where we are and where we’re going.